Bipolar disorder might be common around the world, but on a personal level of every sufferer, it is a significant life-changer, often disrupting life rhythm and compromising the relationships. It can affect women of all ages, but it tends to have a more severe presentation when diagnosed in adulthood. 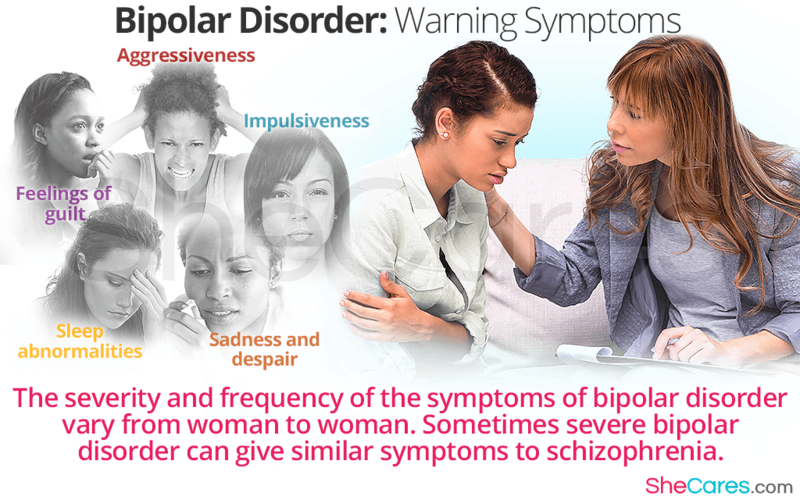 Luckily, modern medicine offers various treatment options to enable women with bipolar disorder to lead healthy and productive life. Keep reading to learn the most important things to know about bipolar disorder. Bipolar disorder is a treatable mental illness characterized by dramatic shifts in mood. It was previously called a manic-depression, because mood fluctuations include high states, called manic episodes, usually followed by low states, called depressive episodes. The manic and depressive episodes usually occur in a sequence, but occasionally, both manic and depressive symptoms occur at the same time, which is then called a mixed state. Sometimes severe bipolar disorder can give similar symptoms to schizophrenia, such as delusions and hallucinations, which often results in a misdiagnosis. There are four types of bipolar disorders. Their presentation is often similar, but its intensity varies. Bipolar disorder I. It involves experiencing manic episodes for at least seven days and the depressive episodes, often for two weeks. Bipolar disorder II. The symptoms can be exactly the same as in the first type, but the episodes, called hypomanic, are milder and shorter, typically lasting for four days. However, the depressive states can be significantly prolonged. Cyclothymic disorder. In this type of bipolar disorder, there are frequent cycles of hypomania and depression, but their symptoms do not fit the criteria for the previous two types. Other bipolar and related disorders. Sometimes the symptoms do not follow the typical pattern, for example, only manic episodes are present without the depressive ones. Since untreated bipolar disorder might result in risky behavior, substance abuse, or a suicide, it should be promptly evaluated by a physician. Every woman experiences bipolar disorder episodes differently, so it is important to be pro-active and seek help when manic or depressive episodes start interfering with your life or become more frequent and last longer. Occasionally, women have to be hospitalized for bipolar disorder, when manic episodes lead to a psychosis with delusions and hallucinations, which often puts them at risk of hurting themselves. Bipolar disorder worsens with time if left untreated. Its treatment includes a combination of medications, such as mood stabilizers, and psychotherapy, like cognitive behavioral therapy. Identifying the triggers based on the previous episodes and learning to avoid them can help you better manage your disorder and make you feel more in control. Bipolar disorder is a difficult illness not only for the sufferer, but also for her family, friends, and other people in her surroundings. Its is often a challenge during pregnancy, the postpartum period, as well as menopause, when women are more vulnerable to new triggers and mood shifts due to various psychological and physiological changes, such as hormone fluctuations. Besides pharmacology and therapy, creating a strong support network is essential in managing the episodes and preventing more serious complications of bipolar disorder. Are older women with depression at increased risk of falls and fractures?